Our customers are concerned about sugar intake and always have been, particularly white sugar, which has absolutely no vestige of nutritional value in its make-up. It is as John Yudkin, physiologist, nutritionist and founding professor of the Department of Nutrition at Queen Elizabeth College London, says in the title of his 1970’s book: Pure, White and Deadly. So much has been written about the problems of obesity and type two diabetes that people are getting worried about their sugar intake. Personally, though, I think the growing obesity problem is not just about sugar. For instance white bread is also a devitalised food which, apart from the vitamins and minerals added to replace those lost in the milling process, is basically the same as wallpaper paste i.e. starch. The less said the better when it comes to cakes and pastries using both white sugar and white flour! Whilst it is appalling that customers may unknowingly be subjected to 25 teaspoons of sugar (white, to be sure) in some café drinks, the real cause of obesity is that people generally eat too much. There’s a saying in the purist naturopathic field: one third of what you eat keeps you alive, the other two thirds keep the doctors in business. The sugar focus has certainly created an interest in alternative sweeteners – not the nasties like saccharine and aspartame – but xylitol, coconut sugar and stevia. There are others which do, at least, provide a small element of nutritional value such as light, medium and dark muscovado sugars; molasses in both crystal and liquid form; rice malt and barley malt syrups; fruit sugars such as agave and date and, of course, maple syrup and a variety of honeys from around the world. All these are basic commodities found in our store and, indeed, most health food stores. Of all the sweeteners honey, undoubtedly, is the most demanded. I do think people need to look at everything they are consuming – not just sugar – so as to achieve an ideal balance. For instance it is noticeable that some people are raising the issue of the natural sugars found in fruit and vegetables. For most of us this is really a red herring, apart from those with diabetes and some lesser known diseases who have to restrict their intake to certain fruits and vegetables. After over 50 years in the health food business I don’t know of anyone who has put on excess weight from eating fruit and vegetables, especially raw. And that is the real issue: fruit and vegetables, as raw as possible, should represent a substantial part of one’s diet. It’s not just an apple – a large salad a day keeps the doctor away. 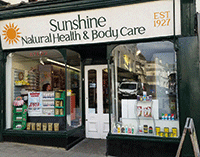 Located in the Cotswold town of Stroud, the Sunshine Health Shops have been trading for over 89 years. There are currently three generations of the Hill family involved in the business, ranging from the store’s owner, Ray, to his son Andrew, who has managed the High Street store for the past 29 years, and grandson Stuart who worked at the Sunshine Organic Bakery and now works at the High Street store. The Hill family offer a wealth of knowledge about natural health and wellbeing, encouraging the principles of natural dietetics, herbal medicine and nutritional supplementation as a safe path to a healthier life. The store stocks over 5,000 products, including a wide range of supplements, remedies, natural medicines, cosmetics, toiletries and health foods.